The Minke Whale, also called the Little Piked Whale or, Lesser Rorqual, is a whale that is found almost everywhere in the world in two distinct species and at least two subspecies. 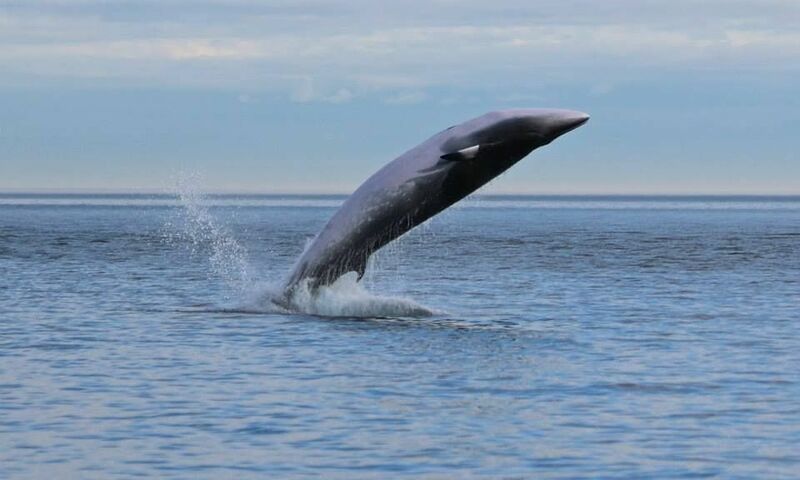 These are a type of ‘baleen whale’ that are relatively smaller than many other whale species. Minkes are the smallest members of the rorquals or ‘great whales’ group. Size: The males have an average length of 6.9 m (23 ft) and females 8 m (26 ft), respectively. Weight: In both the sexes, the typical weight of the adults is 4–5 t (3.9–4.9 long tons; 4.4–5.5 short tons). Body: They usually have a black, purplish or dark-gray coloration above (on the dorsal side) and white underneath (ventral side), and have between 240 and 360 baleen plates on both sides of their head, close to the mouth. 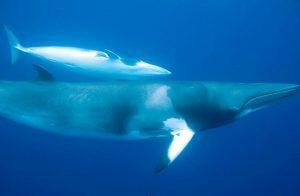 Sexual Dimorphism: There are no pronounced differences between the sexes of the minke whales, except that the females are somewhat larger by size than their male counterparts. The estimated lifespan of the minke whales is up to 50 years. 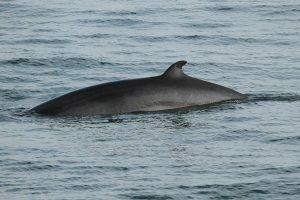 The Common minke whale (northern minke whale) Balaenoptera acutorostrata, which are further categorized into three regional subspecies, viz. 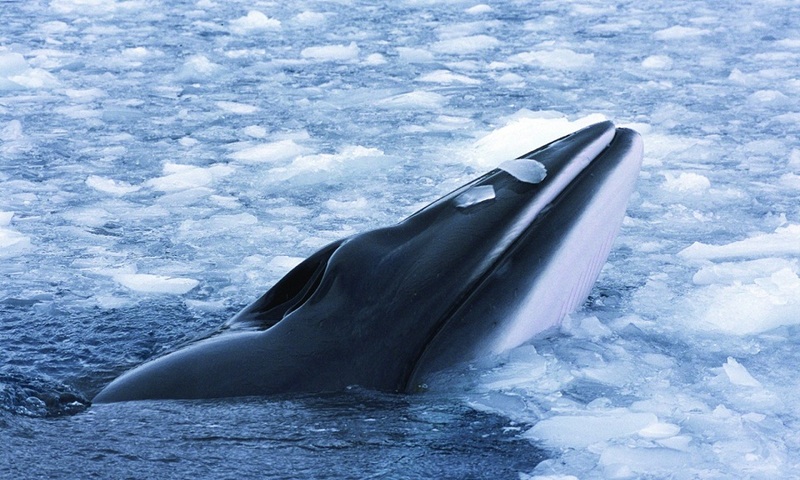 The Antarctic minke whale (southern minke whale) Balaenoptera bonaerensis. 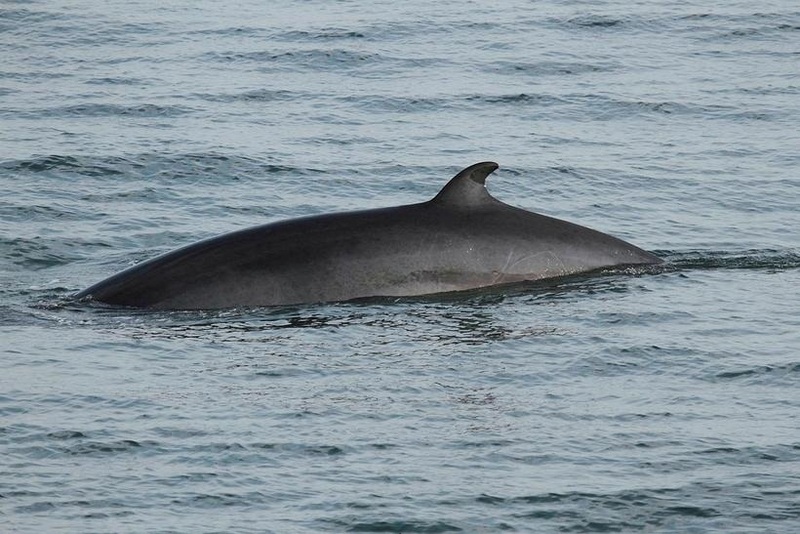 The Northern or common minke whales have a white band on each of its flippers, which is not present in the Southern or Antarctic minkes. 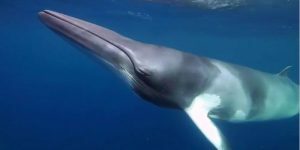 The common minke whale occurs in all the oceans of the world, ranging from the polar waters to the tropical, whereas the Antarctic minkes are found in all the oceans of the southern hemisphere. Both the species prefer both the coastal and the offshore waters of the oceans. These mammals are basically solitary creatures and move alone. Before taking a dive in the deep, they breathe around three to five times at short intervals. Each dive can last for anything between two to twenty minutes, after which they need to float up again for inhaling air. 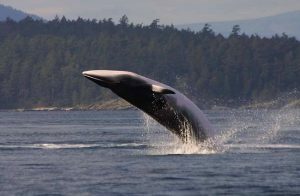 The maximum swimming speed of these whales is around 38 kmph (24 mph). Both the species migrate during specific seasonal changes, heading towards the poles during spring and towards the warmer waters of the tropics during fall and winter. The difference in seasonal timing refrains them from mixing with each other. In a long-term photo-identification study conducted on coasts of British Columbia and Washington showed that a few individuals could cover distances of up to 424 km north during springtime, and 398 km south during the autumn. However, many information about their ways of migration are still unknown. They are primarily ichthyophagous (fish-eating) species that mostly seem to prefer species like capelin, cod, herring, and pollock. However, their diet also includes pelagic crustaceans and cephalopods, which varies by season, region, and age. The sexual behavior of these creatures is not properly known. Mating and calving normally probably occurs during the winter season. 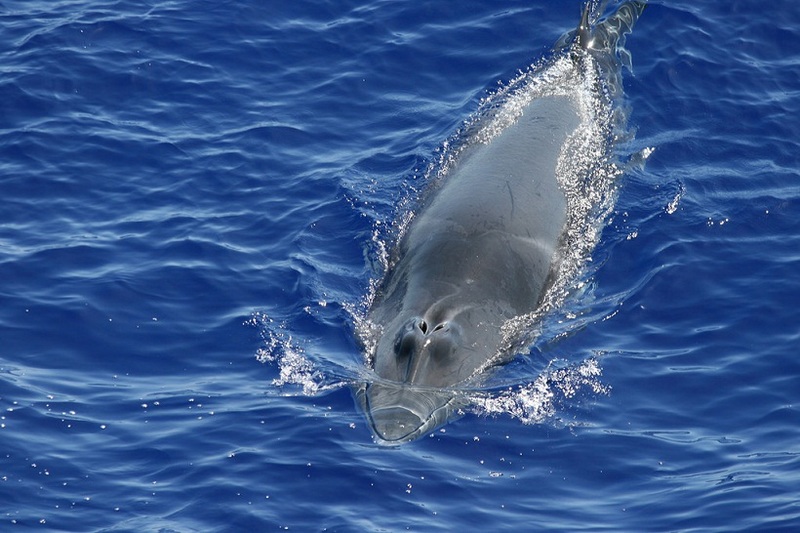 The female minkes typically give birth to one single baby (called calf), after a gestation period of 10 to 11 months. The newborn juvenile is around 8 to 11.5 feet in length, with a weight of about 700 to 1,000 pounds. The young whales are weaned after about 4 to 6 months. A female is usually ready to give birth to the next offspring after 14 months. The babies and the mothers are usually seen in the lower latitudes. The estimated age of sexual maturity of these mammals is between 3 and 8 years of age (7 to 8 years for Antarctic minkes). This is about when these whales attain a length of about 23 feet. Their digestive system is composed of four compartments that have a high density of anaerobic bacteria, which suggests that these mammoth mammals rely on microbial digestion in order to extract the nutrients provided by their consumed food. Much like the odontocetes, these whales have fat depositions in their jaws that help them in the reception of sounds and calls in the deep waters of the ocean. 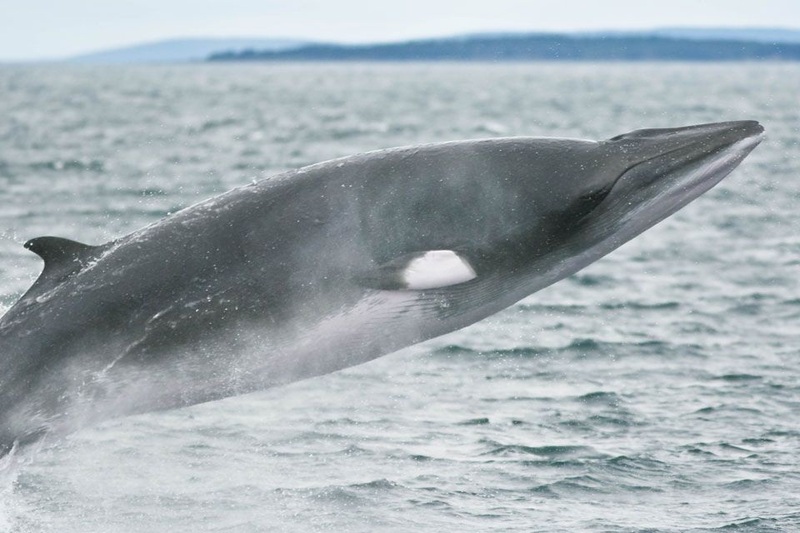 The most common predator of these whales is the killer whale. However, they are also hunted by humans for their oil. The IUCN 3.1 has declared the common minke whale as ‘LC’ or Least Concern, and the Antarctic minke whale as ‘NT’ or Near Threatened. The name ‘Minke’ is thought to be a partial translation of the Norwegian word minkehval, which is probably after Meincke – a Norwegian whaler – who mistook a northern minke whale for a blue whale. 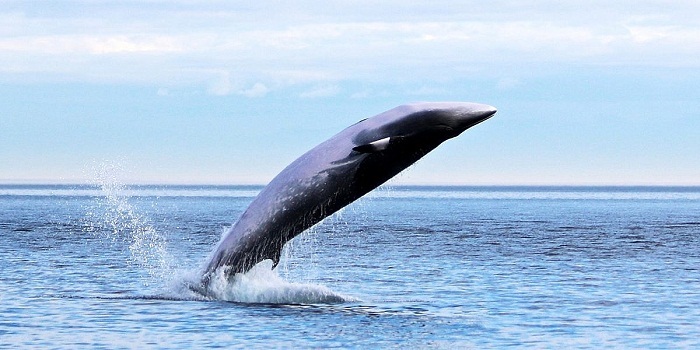 The auditory system of these whales has not yet been understood well by the scientists. The minkes can be so curious that they are known even to approach ships, or at times, even keeping up with moving vessels.